Sustainability is a hot topic these days, even making its way into advertisements for one of the world’s biggest companies (see below). I would guess that on this very day, you have thought about sustainability, or at least encountered the idea. Maybe you saw a commercial that told you to “go green”, or read an article about climate change, or passed by a wind-turbine, an array of solar panels, or a recycling bin. You probably have your own thoughts about what sustainability means, but I’ll ask you to go along with my definition for now: sustainability is the capacity to promote long-term well-being. And for our purposes, let’s think about it in a human-sense—that is, sustainability is the capacity of humans to promote the long term well-being of the planet, of society, etc. 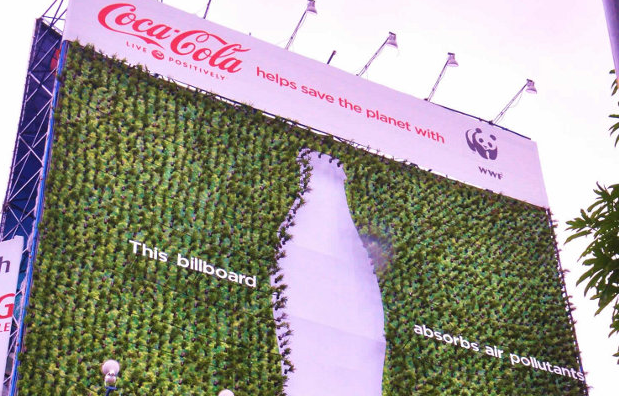 A “living” billboard made of tea plants growing in recycled Coke bottles. Image source. So, since this is a science blog, where does science fit into sustainability? I’m sure that you already know something about this. For example, you probably know that scientists study how to trap and store carbon dioxide, how to make cars that run on hydrogen rather than fossil fuels, and how to derive useable electricity from the wind and sun. These examples are all related to one particular aspect of sustainability: the sustainable use of energy. But there are other ways that we can think about sustainability, and other ways that science and sustainability fit together. 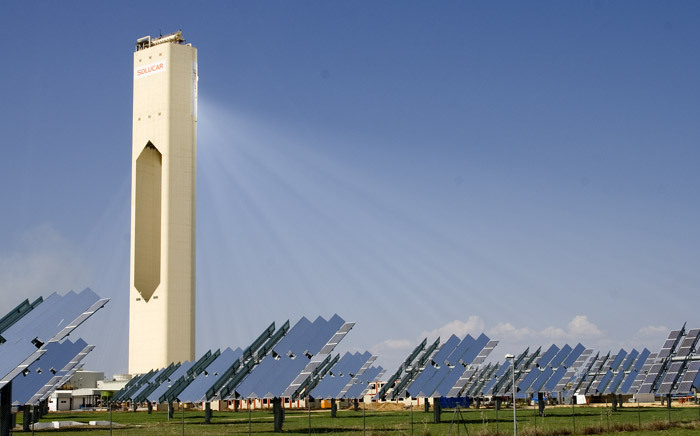 A Solar Tower—one of many kinds of solar energy collection devices made possible through science and engineering. Image source. One such way is the sustainable use of engineered nanomaterials. This blog has discussed nanomaterials enough that I’m sure you know what I mean: materials that are very small and that have unique properties because of their small size. And by engineered, I mean nanomaterials that are produced by humans, not those found in nature. The key idea for us is that nanomaterials behave uniquely. For example, consider a type of nanomaterial called quantum dots. Quantum dots can be made to change color by changing their size. Sure, you say, no big deal. But imagine if you created a type of pretzel that changed from brown to red when broken in half. You would probably be really excited to sell these pretzels, because they are unique. But no one has ever eaten color-changing pretzels—what if they make people sick? Before selling them, you should show that these pretzels are okay to eat—if they aren’t, you could either change the way that they are made or decide to scrap the idea before anyone gets hurt. Solutions of quantum dots of different sizes fluorescing under ultraviolet light. Thanks to Yizheng Tan for this image. The same logic applies to engineered nanomaterials. We know that these materials behave in unique ways that make them useful and exciting, but we need to know if using them will have unintended negative consequences. For example, if we spill a bunch of quantum dots into a lake near our production facility, will this hurt the plants, fish, or other organisms that inhabit the lake? What about people who swim in the lake? To ensure the sustainable use of engineered nanomaterials, we need to know how they interact with living things, like those just described. We want to ensure nano-bio compatibility, that is, the compatibility of nanomaterials with living things. This is where our center comes in. The goal of our center is to come up with basic rules to describe how engineered nanomaterials interact with living things. If we know these rules, then we can specially design nanomaterials to minimize negative consequences. Coming up with these rules isn’t easy, especially because there are so many types of nanomaterials and so many types of living things to consider. To get around this, we’ve made the problem a little simpler. Our approach is similar to how you might consider setting up two people on a blind date. Rather than consider all the facets of each person’s personality and how they might influence their interaction, you consider just the most important ones: their extraversion, agreeableness, conscientiousness, etc. In our case, rather than try to consider all the possible combinations of nanomaterials and living things, we consider just the most important features that influence their interaction. By understanding these important features, we believe that we can create basic rules for the sustainable use of nanomaterials. The living things we use include artificial cell membranes (not really living, but helpful since living things can be so complex), bacteria, and water fleas. Don’t worry too much about the details of these choices—the important thing to understand is that these represent progressively more complex forms of life. On the nanomaterial side, some of the features we consider are size, shape, and charge (positive vs. negative vs. neutral). We vary these features one at a time and observe the response of our living (or artificial living) systems at multiple levels of complexity. If we find some nanomaterial feature that causes damage in each, we say that this feature should be avoided because it is not nano-bio compatible. This is how we create basic rules for the sustainable use of nanomaterials. Water fleas are made of many cells. Bacteria are made of single cells. Cells possess cell membranes along with lots of other stuff. Note: this image is most definitely not to scale. Sustainability is a commonly-used term these days, but it is often considered only in a narrow context. Hopefully this post has encouraged you to think about sustainability in a broader way. Science plays an important role in promoting sustainability. However, to fully address all aspects of this complex issue, perspectives outside of science are also needed. For example, even if scientists can identify basic rules for creating sustainable nanomaterials, how do we ensure that these rules are actually followed? Clearly, this requires lawyers, legislators, regulatory agencies, etc.—the more people involved in the conversation about sustainability, the better.